The Rev. Katie Gillett reflects on Jeremiah 31:31-34: “Do you ever take time at the end of the day to recall the day and reorient yourself? 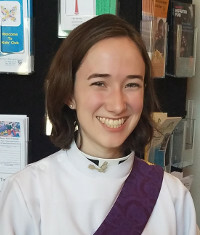 When I think of reorienting, I think of turning away from the anxieties, worries, and stress and turning instead to joy and peace.” Episcopal Deacon Katie Gillett is currently attending seminary at Duke University and will be with us learning and preaching until the end of April.